As a bookish, but unfortunately impressionable youth, I wasted several hours searching for magical worlds out in the woods, behind mirrors, and inside wardrobes. I yearned for the sorts of adventures experienced by Alice, Dorothy, Lucy, and a host of other young women whose curiosity far outstripped their common sense. I Hate Fairyland by Skottie Young makes me grateful that my childhood quests inevitably returned me to my relatively boring childhood. Having worked at Marvel for over a decade on such titles as Rocket Raccoon, X-Men, and perhaps most relevantly The Wonderful Wizard of Oz , Skottie Young brings his demented, yet adorable artwork to Image comics. Gertrude, the main character of the book, is whisked away to Fairyland after making an impulsive childhood wish. She almost immediately regrets her decision after her fall down the rabbit hole results in a gruesome compound fracture. Pleading to be returned home, the young girl is instead tasked with an inane quest to find a magic key, a quest at which she fails spectacularly for over thirty years. Yes, the idea of the fractured fairytale has been done before. However, it has rarely been done this well. I Hate Fairyland is a guilty pleasure of the highest order. Outside of Squee by Jhonen Vasquez, I cannot think of another book that is simultaneously this lovingly adorable and stomach-churningly grotesque. As a forty-year-old woman trapped in a child’s body, Gertrude makes bloody mayhem throughout the candy-colored fantasy kingdom. Everything is cloyingly cute from the bullets she uses to blast a snarky narrator moon out of the sky to the mushroom guards she gleefully chomps down to make her escape from an evil slug’s casino lair. 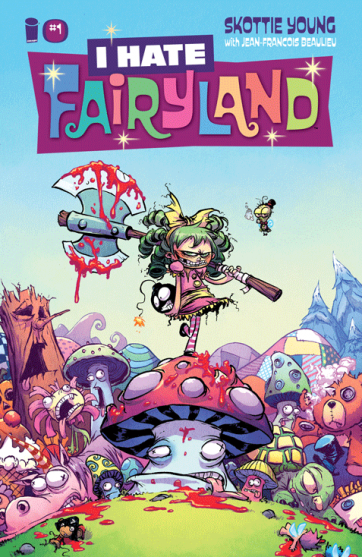 Although I Hate Fairyland is not recommended at all in any way ever for young children, your average twelve-year-old will probably find it to be a hoot and a half. In a way, the book’s greatest spiritual predecessors are MAD magazine and the early Looney Tunes cartoons (except with buckets of blood, seriously so much blood). It is violent, grimy, and likely to lead to fainting spells amongst the more self-righteous members of decent society, but for those looking for a little bit of cartoon chaos in their comics, Skottie Young’s book will hit the sweet spot. Just caution your younger self from searching out Fairyland. It is not a safe place. I Hate Fairyland Issues #1 and #2 are now available at your local comic retailer and online. Published by Image Comics, Writing and Art by Skottie Young, Colors by Jean-Francois Bealieu.